It’s pretty amazing how advanced DSLR cameras have become in recent years, and brands like Canon keep pushing the envelope. 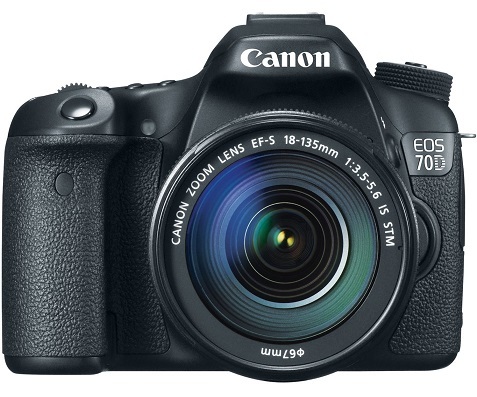 Canon recently introduced the all-new Canon EOS 70D which they are describing as a game-changer. It’s isn’t their most expensive camera of course, but for just under $1,000 (body only) it’s impressive how many advanced features you have available. – 20.2 Megapixel CMOS (APS-C) sensor, 14-bit A/D conversion, ISO 100-12800 (expandable to H: 25600) for shooting from bright to dim light and high performance DIGIC 5+ Image Processor for exceptional image quality and processing speed. This camera will deliver stunning images. – Canon’s innovative Dual Pixel CMOS AF enables you to shoot video like a camcorder with smooth, fast, and accurate autofocus; lets you enjoy instant and precise autofocus even when shooting stills from a variety of angles with the freedom provided by the Vari-angle LCD. 19-point all cross-type AF system (including a high-precision f/2.8 dual cross-type AF center point) with a wide area arrayfor exceptional autofocus performance and greater compositional freedom when shooting with the viewfinder. Intelligent Viewfinder with superimposed LCD display provides approximately 98% field of view, and Multi-Aspect ratio in Live View broadens your choices in composition. This camera is intended for users who want to shoot professional-quality video. Some customers who reviewed the camera complained that the autofocus didn’t work well with some lenses, so pros will want to do their research. But overall the video capabilities are impressive. – Built-in wireless technology allows you to wirelessly transfer your images to social networking sites through CANON iMAGE GATEWAY, share your images with wireless-enabled Canon cameras, or upload virtually anywhere on your iOS® or Android(TM) smartphone* with the free download of the EOS Remote app. This aspect probably got the most negative reviews. Some complained that the wireless didn’t work when shooting video. If this aspect is important to you you’ll need to do more research. If wi-fi isn’t important you may even want to consider the less expensive 60D which is still an excellent camera. For most users, this camera will have more features than they will ever use. It’s great for hobbyists, semi-pros and many professionals as well. If you’ve been looking for a new DSLR and want to shoot a lot of video, then you have to check this one out. It’s also obviously a great gift idea if it’s in your budget range.